I had a great time at the Toronto Tea Festival this past weekend. The festival was at the Toronto Reference Library, and offered a variety of talks on tea, ceremonies and of course, a lot of tea vendors. I focused more of my time on the talks this year as my tea cupboard is getting, well, pretty darn full! I am very excited, however, about the Moose Tracks Black tea I picked up from Herbal Infusions which smells absolutely amazing! I’m looking forward to trying this one as a latte. 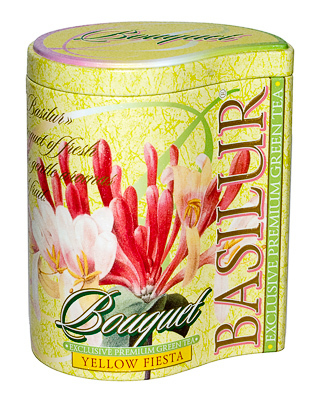 I also picked up some new tea from Basilur Tea, a tea company that offers delicious blends at low costs – and in beautiful tins! I grabbed the Yellow Fiesta citrusy green tea. I was also excited to discover that Bare English and Co – a company that creates tea infused lip balm – now has even more flavours! Super pumped for the amazing smelling Cucumber Melon balm that I purchased. The balms can be found at Rexall, and soon to be at Shoppers as well. Bill Kamula hosted a great talk on “Buried Treasures”, focusing on the tea collection he explored at the Royal Ontario Museum. Some really neat history of tea culture is found in the collection storage at the ROM. The museum even has a puerh cake in its collection! Jeff Fuchs offered a great talk on Puerh’s Ancient Roots. It was absolutely amazing to hear his stories about sourcing tea from Asia. His goal was to bring the human element of tea forward, and he definitely succeeded. Interestingly, he also discussed how he does not like flavoured teas. He once tracked the source of a flavoured blueberry tea, and brought it back to the original grower of the tea who did not even recognize his own tea leaves. While I still enjoy my flavoured blends, it was interesting to hear how this part of the world sees tea as a fuel, food and medicine that’s meant to be bitter. The images he takes while abroad are also amazing. Click on the picture below to see even more wonderful pictures from Jeff Fuchs. Lastly, I checked out Diane Borsato’s talk on Tea in Contemporary Art, where she showed us images of how tea has been represented over time in the art world. One of my favourites examples that she showed us was David Shrigley’s contemporary artwork depicting tea. 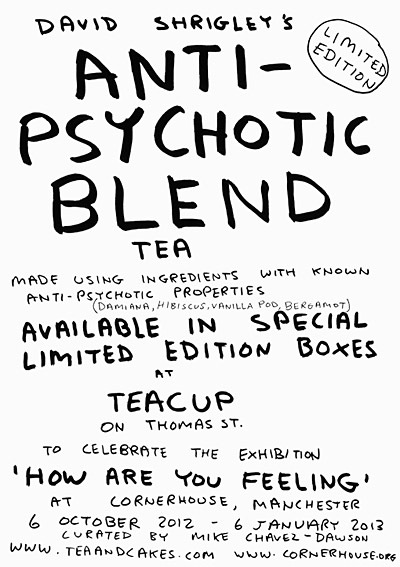 I thoroughly enjoyed the anti-psychotic tea blend! All in all, a great day at the Tea Festival! Some other neat companies that I discovered and am looking forward to exploring more in the future were Lemon Lily and teALCHEMY. Lemon Lily offers over 150 varieties online. Not too shabby! TeALCHEMY creates seasonal blends, with a philosophy of creating something new through blending. Neat! I’m looking forward to seeing what the festival has in store for next year. Assuming the festival continues to grow, I hope to see even more vendors next year at a potentially bigger space!